(Athens,GA) – Every four years Americans come to the polls and make their voices heard, fulfilling their responsibility to our great nation by choosing a beer from Terrapin’s past they would like to see rebrewed (and coincidentally electing a new President of the United States as well). 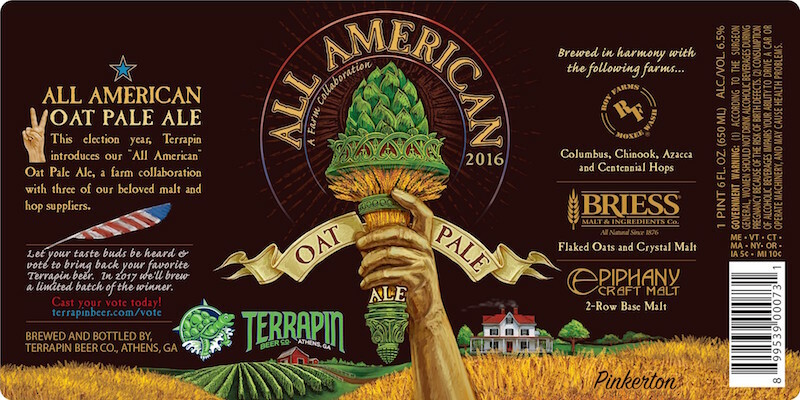 To celebrate this most precious of rights, Terrapin is releasing the All American Oat Pale Ale made with all American ingredients. This ode to our great land is a collaboration with three of our All-American craft suppliers of hop and malt: Roy Farms, Briess Malt & Ingredients Co, and Epiphany Craft Malt. The dank hop flavor and aroma of the All American Pale Ale comes from a collection of Columbus, Chinook, Azacca and Centennial hops grown in the heart of American hops country, Yakima Valley, WA by our friends at Roy Farms. The ales smooth mouthfeel and malty backbone are the result of Flaked Oats and Crystal Malt from Briess Malt and Ingredient Company, America’s oldest producers of specialty malts to the American craft beer industry. The 2-Row Base Malt comes from Epiphany’s a relative newcomer to the American craft malting industry located locally one state away in North Carolina. This year’s election will decide a beer for our 2017 line-up. There will be a primary election (July – August 31st) by state to narrow the ballot to no more than 13 beers, that will find their way to the general election starting September 1st and ending on election day. To make the ballot a beer had to be officially brewed, packaged and discontinued by Terrapin….colaborations are not eligible. Team Terrapin will be holding voting events across the southeast, but everyone can let their taste buds be heard at terrapinbeer.com/vote. Future beer drinkers are depending on us so don’t’ let them down and make your vote count! Let your taste buds be heard and vote to bring back your favorite Terrapin beer. In 2017 we’ll brew a limited batch of the winner. Cast your vote today! Roy Farms, located in Moxee, WA, has always been family-owned and operated. For over one hundred years, Roy Farms has been working the soil in the Yakima Valley to provide quality hops to brewers worldwide. By focusing on the well-being of the environment, their employees, their community, and their customers, Roy Farms proudly offers safe, quality products while staying true to their roots. American craft beer in the 1970s and remains the only malting company in the world dedicated to the production of specialty malts for the American craft beer. Epiphany Craft Malt, established in 2014 and located in North Carolina, produces a variety of malted grain products for brewers, distillers, and other food ventures. Partnering with our farmers and customers alike is a core of our malting operation. We are committed to establishing a local supply, practice sustainability, and foster a positive, respectful workplace.